The marrow from my speech at FutureEverything 2012 - a big thank you to Jodi Rose for making this beautiful PreziTation for me to use as a frame for the keynote. Who is the system to serve? What is a parliamentary representative? Who does he pledge alliance to? What are the cornerstones of Democracy? What is the purpose of a constitution? I want you to think about these questions and find out what their content means to you. I am an activist in parliament. The longer I serve, the more I think about the meaning of the questions I have just posed. The more I understand how the system works, the more obvious it is to me that there is a serious system error. The system is like the hard drive on computers you would have to defrag in order for them to work, the bigger the files the less efficient the computer would work. The problem with our systems is that they are too big, too alienated from the people they are supposed to serve. It is too difficult for the public to be able to influence and have impact on the (re) in the rePublic. Sometimes when the computer is too fragmented the best solution is to zero it in order for it to work, sometimes a complete system upgrade is the only way out. We have reached the point in our democracies that we need to zero the system and install a new system. We need to move away from the big complex to the small fast system, where each and every person has to understand that we are the stuff that makes the system. We are the system. We are the government. We are society. We are the power. We are the law. It is not beyond us, unreachable nor undesirable to be it, the system is a reflection of who we are. In order to empower people to act on this awareness and to start to apply changes through our only means: through action, we need to have direct democracy with the liquid add-on. We need to craft our constitution for and by the people. (Constitution is the agreement of a nation on what sort of society they choose to be). Law is currently crafted by and for the 1% - we need to simplify our laws and make sure we agree on the spirit of the law, rather then adding on their complexity with endless patchwork. The cornerstones of society are freedom of information, expression and speech. The Internet is the last free world, that has enabled us to connect, share, be informed, act and resample our creativity. The internet is now under serious attack, as the corporations and governments are trying to place their reins of power on it, in order to industrialize it and to have absolute control over how we connect, share, be informed, act and resample our creativity. I am a hacker in parliament, I went into the system in order to understand how it works and my conclusion is clear: Install new system with a new form of democracy of the future, where we move away from democratic dictatorship with many representative heads to a direct responsibility of direct liquid democracy. Are you ready to be the co-creator of your society? Do you understand the importance of your participation? We are running out of planet, so for the future of everything it is time to wake up and start co-creating. In a proposal moved in the Icelandic Parliament by Birgitta Jónsdóttir with support of 15 other parliamentarians from all parties in the Icelandic Parliament, expressed deep concern over the escalation of violence and repression by the Chinese authorities against the Tibetan people, that has led to more then 30 Tibetans, mostly monks and nuns, who self-immolated in despair since 2009. The proposal condemns the growing violence at peaceful protests in Tibet, as was the case early this year when 6 protestors where killed and over 60 wounded by Chinese security forces, according to reports by human rights groups. This parliamentary proposal urges Chinese authorities to halt the forced reeducation on monks and nuns in Tibet where they are forced to condemn H.H. Dalai Lama and denounce him as their spiritual leader, despite the integrated role he plays in their religion, and not complying means the monks and nuns are faced with serious punitive consequences. The Parliament urges Chinese authorities to stop the enforcement of the Tibetan Nation to assimilate into Chinese culture, for example by ensuring Chinese as their prime language, where Tibetan children are forced to learn and speak Chinese instead of their native Tibetan language. The Parliament urges Chinese authorities to lift the military siege of Tibet and allow international journalists to travel to the areas in where the self-immolations were frequent in Tibet; to end the forced settlement of nomads; and that journalists be allowed to report unrestricted and without intervention of authorities. The Parliament urges the U.N. to send a mission to investigate alleged human rights violations against the Tibetan people, such as forced sterilization on Tibetan women, forced settlement of nomads from their natural habit to isolated settlement camps, torture and murder of prisoners, and to investigate what happened to the people who have vanished in relation to arrests of people during the uprising in 2008. The Parliament also urges the United Nations to exert their influence upon the Chinese authorities to resume formal negotiations with the Envoys of H.H. The Dalai Lama. The Icelandic Parliament proposal recommends that the Government of Iceland offers Iceland as venue for the resumption of negotiations between Chinese authorities and Envoys of H.H. The Dalai Lama, for example at Höfði, the venue where Gorbachev and Reagan had their peace talks, who marked the beginning of the end of the cold war. The resolution was first moved the same day as the Prime Minister of Chine paid an official visit to Iceland by invitation of the Icelandic Prime Minister, the 20th of April 2012. Thus we could use that as means to get the issue of Tibet on the agenda during the official visit, inside parliament and in the mainstream media. The Speaker of the Icelandic Parliament refused to allow us have the proposal debated. I organized protest outside the Gala Dinner for the Chinese Prime Minister, I was of course not invited even if I serve currently as a Chair of the Movement, all the other Chairs of the political parties were invited. 100 people showed up to the protest, including Friends of Tibet in Iceland and Amnesty International in Iceland to voice our concerns for human rights violations in China and Tibet. Here is a video and some photos from the protest. China Prime minister in Iceland - and people protest Mr. Wen Jiabao,Prime minister of China is on a official visit to Iceland . He came today,and had a meeting with the Icelands Prime Ministe , Johanna Sigurdardottir. People came to protest China´s reputation in human rights matters. 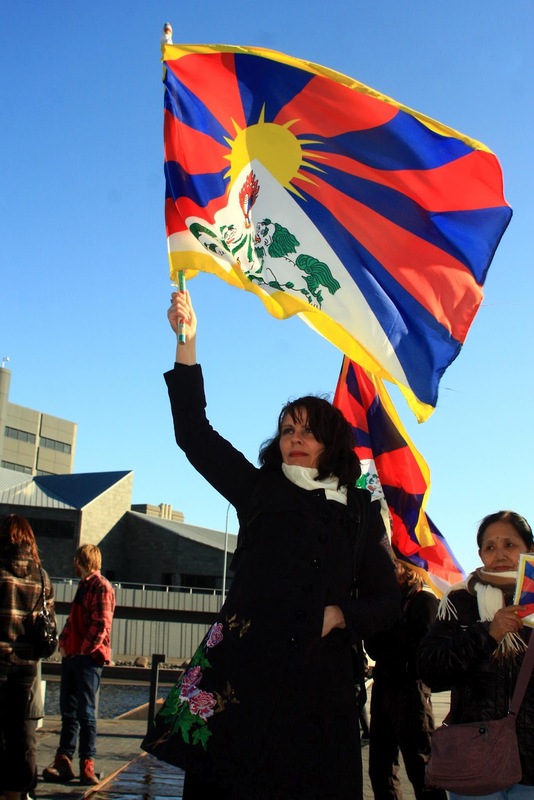 A member of the Icelandic parliament , ms. Birgitta Jonsdottir,attended , and protested China´s occupation on Tibet. You can see here on video number 2. she is holding the Tibetian flag and shouting at the Harp,where Ielands prime minister having dinner with her Chinese counterpart. When the came to the Harp,icelands concert hall,for the dinner, they went into the building through a back door . They did not enter like the Icelandic Prime minister, through the front door. I am thankful that i managed to be among the parliamentarians from around the world that adopted this important declarations, now is a critical time for Tibet. Remain convinced that a sustainable solution to the issue of Tibet can be achieved through genuine autonomy for the Tibetan people within the PRC, as evidenced by the positive experience of the many autonomous regions around the world, and note in particular the example set by the creation of the Territory of Nunavut as a self governing community within the sovereign nation of Canada. Adopt an action program to ensure greater effectiveness in addressing the concerns and advancing the objectives contained in this declaration.